With the fast growth of 4K Ultra HD TVs like Samsung, LG, Sony etc, the word "4K upscaling" comes into sight. Though 4K displays are everywhere, real 4k contents are not. Almost all the streaming videos, DVDs, TV broadcast, Blu-ray and other available contents today are 1080p, 720p or even 480p. To watch 1080P or lower resolutions on 4K UHD TVs or screens, there is a step called 4K upscaling. This post will explain what is 4K UHD upscaling, how it works, the differences between native 4K and 1080P upscaled 4K and how to upscale 4K videos. Check below. Upscaling (also upconverting) refers to a process of matching the incoming small image with the higher-resolution display. And 4K UHD upscaling means enlarging the 1080P, 720P or lower-resolution images to near 4K quality to fit the large 4K display. Simply put, 4K displays have 3,840x2,160 pixels, while 1080P videos have 1,920x1,080 pixels. The 4K displays will have four times as much the screen space to fill than 1080P. 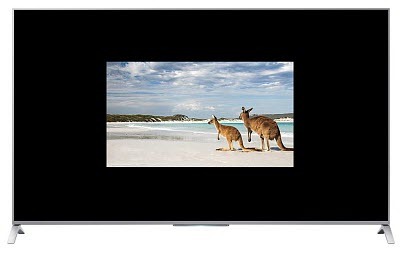 Therefore, if the 4K TV displays a 1080P video without upscaling, the screen will look like below. For lower resolutions, the image will be smaller. What's the Magic behind 4K UHD Upscaling? To enhance videos to 4K quality, there is a video processing technology called interpolation, a process of creating new pixel points within the range of a discrete set of known pixel points. Simply put, as shown in the above picture, it needs to create more pixel pionts to fill the blank area of a 4K dispay. There are several upscaling algorithms to help achieve this. Here we will introduce you the major consumer-level UHD upscaling algorithms used by 4K TVs, Blu-ray players and other devices: nearest neighbor interpolation, bilinear interpolation and bicubic interpolation. Let's see how each method works. Nearest neighbor interpolation, also known as point sampling, is the simplest, fastest and also widely-used method to upscale videos to 4K from 1080P or lower. Unlike the two other methods, it determines the new interpolated pixel by the nearest neighbor point in the input vector or matrix without calculating the value via any weighting criteria or complicated rules. It thus has a lot of blurriness and artifacts. Linear interpolation is implemented in both X and Y directions (and Z for 3D). And bilinear interpolation is a method that uses the distance-weighted average of 4 nearest known neighboring pixel points to determine the new pixel value. The output pixels are heavily influenced by the neighboring four points. This method is better than the nearest neighbor interpolation but also has visible artifacts and blurring. In Bicubic interpolation, the interpolated pixel is calculated as the weighted average of 16 (4x4) nearest neighboring points. 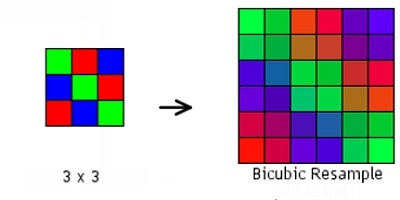 Generally, bicubic interpolation is more complicated than the other two 4K upscaling methods, but generates more fine details than its bilinear counterpart. Currently, many commonly-used 4k video upscaler programs such as Adobe Photoshop and Corel Photo-paint use Bicubic interpolation as the standard. Native 4K vs 1080P Upscaled 4K, any Differences? After learning the 4K video processing for lower-quality video upscaling, it's not hard to tell the differences between real 4K and 4k upscaling. Let's look back at the two kinds of videos. Native 4k: the source video is already encoded in resolution 4096x2160 pixels. Interpolation is a calculation; it won't add extra details that aren't in the source 1080P videos. By using those interpolation methods in most 4K UHD TVs, Blu-ray players, PSP, editors, software etc, upscaling 4K always comes at the cost of perceived quality loss like motion blur, marcor-blocking, interlacing, color loss, and other artifacts. And the higher the source resolution the better the results will be in 4k. When the source videos are rather poor in quality like VHS videos, upscaling 4K won't improve many details, and may lead to mixed results. So How to Improve Video Quality? 1. Upscale videos to 4K from 1080P, 720P, SD 540P, 480P or other low-quality files. 2. Flexible parameter adjustments offers options to upconvert videos to 4K 60fps or 30fps, compress upscaled 4K videos to 30%-70% smaller, etc. 3. 370+ video/audio codecs to upconvert mp4, mov, avi, mts etc from/to 4k HEVC h.265 and mp4 for Samsung, LG, Sony UHD TV, YouTube, others. 4. High Quality Engine, Deinterlacing and Auto Copy features provide professional post-processing that outweighs the 4K upscaling results of other 4K upconverter built in UHD TVs, PS4 Pro, Xbox One, Photoshop etc. 5. Fastest 1080P to 4K expansion speed, 5-8x faster processing speed than other 4K video upscalers due to the unique support for Intel/Nvidia/AMD CPU & GPU hardware accelerations. Free download the 4K UHD upscaling software on the computer. Select the version based on your operating system. 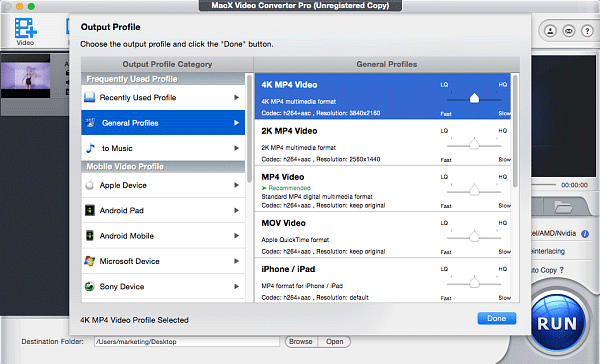 Step 1: Launch the 4K upscaler and click the Video button with a Plus icon to load the lower-resolution video. 1. Enable the Hardware Encoder box on the lower right corner of the interface to apply the Intel QSV/Nvidia/AMD CPU & GPU hardware accelerations and allow the fastest 1080p to 4K converting speed. 2. Enable the High Quality Engine and Deinterlacing boxes in the same position and they will offer advanced post processing for the best 4K quality. The enhanced quality is thus obviously better than that of the 1080P videos upscaled by 4K TVs or other upconverting devices or programs. 3. 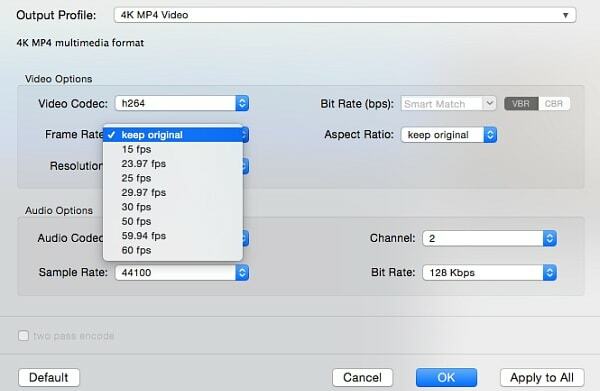 Click the parameter adjust button with a gear icon , and you can adjust the upscaled 4K video to 60fps, 30fps, 25fps, bitrates, aspect ratio as you need. Step 3: Click Run and start the video processing. The combination of advanced hardware acceleration, mutli-core CPU and hyper-threading ensures the fastest video speed, about 5 to 8 times faster than other upscalers depending on the computer configuration. Then you will get a video with 4K quality which you can hardly tell the differences to real UHD sources. Note that if your destination is a mobile, 4k upconverting will increase the video size. And also full HD and 4K look almost the same on small displays. What's the secret behind 4K UHD video's superb quality. Are you ready to embrace the future of resolutions. 4K players that play 4k with highest quality and without lag. Change video resolution, it's your call.